The most successful ad type on Google's valid Blogger AMP template is AMP Sticky Ad. This type of ad will show an overlay at the bottom of the screen. But visitors can still eliminate these ads by pressing the close button that contained in layout amp-sticky-ad. Here's the problem, which makes the ads often ignored. That's why you need to modify the layout to make the ads look more attractive. By using CSS, it can certainly be done. Just by doing 'override' on the amp-sticky-ad selector, the display will change. 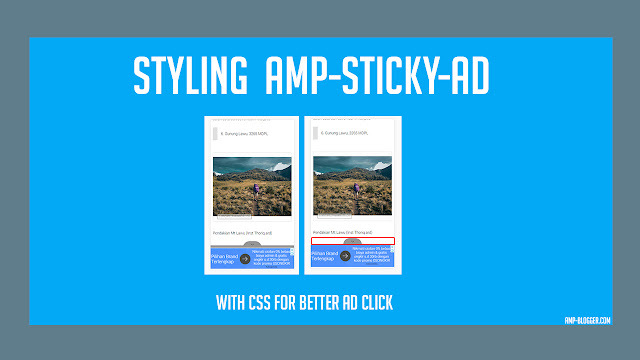 I will explain how to customize AMP Sticky Ad by using CSS below. On amp-sticky-ad, selector contained in amp.css among others .amp-sticky-ad, .amp-sticky-ad-close-button and .amp-sticky-ad-top-padding . I try to modify amp-sticky-ad and amp-sticky-ad-close-button to look similar to sticky ad on Google AdSense Auto Ads. Open EDIT HTML in your Blogger Template dashboard, then search for <style amp-custom='amp-custom'>. Copy the following CSS code to modify close button on amp-sticky-ad, paste it after the code <style amp-custom='amp-custom'>. To proceed to the final process, click save. To see if the display changes, please access your blog on your smartphone.